A revolutionary concept in bass overdrive. From the 2015 'Fare Thee Well' Tour. "And I saw a Bass Blowtorch there too for distortion" - Bryan Kehoe at 2:38 of this *DunlopTV* video. This is a photo of the Pantera, Kill Devil Hill, and Down's bass player Rex Brown's pedal board. On the far top left of Rex Brown's pedal board is the MXR Blowtorch. Very distinct in appearance due to the silver body and orange caution stripes. 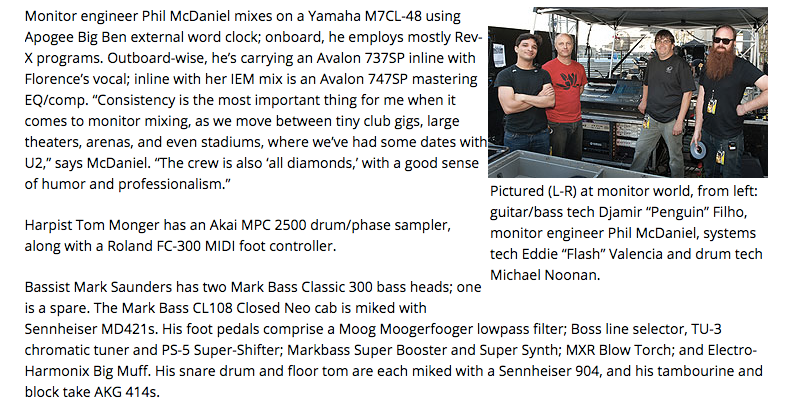 Another one of Mark's pedals is the MXR Blowtorch according to [this article](http://www.mixonline.com/news/tours/all-access-florence-and-machine/368254) from *Mix Online*. Doug has a large amount of effects and bass gear both on the floor and in his rack. Here is some of the gear he's been seen using before. According to East's artist page on the Dunlop website, he's using a Bass Blowtorch distortion. "This thing is always changing...here's the latest incarnation of my pedalboard. It's a well organized mess. #WayHugeSwollenPickle #MXRBlowtorch #IbanezClassicPhase #MarkBassSuperSynth #BossEqualizer"
The M-181 MXR Bass Blowtorch bass overdrive pedal is made to deliver the hottest sounds this side of Hades--from a tube-like growl to full-blown distorted madness. Because the Bass Blowtorch's overdrive is focused in the midrange frequencies, you'll retain your low-end thunder and high-end sizzle while the overdriven mids cut through any mix. An active 3-band EQ with a mid shift switch provides precise signal balancing, while the Blend knob lets you balance the distortion with the direct signal for the exact tone you're after. 18-volt performance equals increased dynamic headroom, clarity, and low noise no matter the volume level, and true bypass circuitry means it's really off when you want it off, leaving your signal completely unaffected. Hard-hitting fuzz, with very complete controls (volume, bass, mid, treble, blend and gain), also including a "boost" switch and most interestingly a 3-well-chosen-positions Mid switch, allowing you to select the midrange frequency to be pushed. The pedal runs on 18 Volts, though if you run it on 9 Volts, it will sound surprisingly close to a ZVex Woolly Mammoth.